For these pages, wild rice refers to the genus Zizania. The Zizania wild rice should not be confused with the Oryza wild types, which are also referred to as wild rice (11, 14). The genera Oryza and Zizania are both from the Oryzeae tribe (22), but the term "wild rice" has stuck to the genus Zizania, even though it isn't technically a rice (5, 6, 11). Wild Rices belong to the genus Zizania, from the Greek Zizanion - a wild weedy grain that typically grew among wheat crops ( 3, 21). There are four species in this genus, three which are native to North America (Z. palustris, Z. aquatica, Z. texana), and one native to Asia (Z. latifolia) (11, 22). Z. palustris is the main species of wild rice harvested for food, and is the one most often thought of when the average person thinks about wild rice. Commonly confused with Z. palustris, Z. aquatica is a non-cultivated wild rice and its smaller seeds are not commonly used for food (8, 11). These two species are annual grasses (11). Many people use the terms interchangeably, but it is not accurate. Z. texana and Z. latifolia are both perennials. 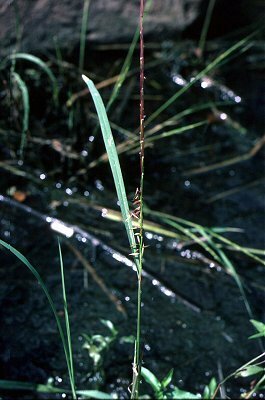 Neither species provides seeds harvested for food, however the stems of Z. latifolia are edible (21) (see Wild Rice Nutrition). The Zizania grown for grain - Z. palustris - is the focus of these Wild Rice pages, unless otherwise noted. 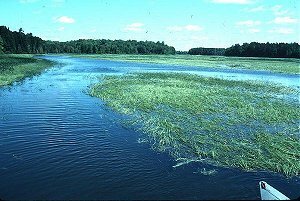 Wild rice is one of two grains native to North America (the other being maize (22)), and grows mostly in shallow lake areas, rivers and streams (5, 11, 13, 22). It was a staple food for early North American people, who introduced it to European explorers (6, 8, 11, 12, 13, 22). It is also a staple for wild birds and waterfowl (12). Native Americans called it manomin, meaning good berry (11, 13, 22). Historically wild rice has been harvested by hand in boats by knocking the grain into the canoe with a pole, and although most wild rice is now harvested mechanically it is still harvested by hand (by law) in Minnesota state waters (8, 11, 12, 22). The grains easily shatter, thus using this method requires multiple harvests during the ripening season, and makes mechanical harvesting difficult (8, 11, 12, 13). 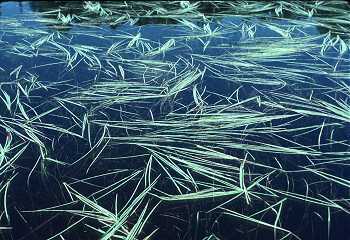 Commercialization of wild rice began in earnest in the 1950's and 1960's after breeding efforts resulted in more shatter-resistant varieties, allowing for mechanical harvesting and crop expansion (11, 13). Not growing well in the hot south, wild rice is well adapted to northern latitudes (11). Today wild rice is grown in diked fields as well as in natural waters in the US and Canada (13), and researchers in Europe are investigating possible wild rice production there (13). California, Minnesota and Saskatchewan are the largest producers of wild rice (22). Agriculture and Agri-Food Canada. 2003. Plant Gene Resources of Canada. http://pgrc3.agr.ca/, accessed 5/23/06. Bois Forte Reservation Tribal Council. 1998. Wild Rice Sales and General Information. Bois Forte Band of Chippewa, Deptartment of Natural Resources. http://www.boisfortednr.com/wildrice/index.html. California Plant Names: Latin and Greek Meanings and Derivations A Dictionary of Botanical Etymology. 2003-2005 Compiled by Michael L. Charters. http://www.calflora.net/botanicalnames/pageZ.html , accessed 5/23/06. California Wild Rice Advisory Board. 2006. Wild Rice Facts. http://www.cawildrice.com/facts.htm, accessed 5/23/06. California Wild Rice Growers Association. What is wild rice? http://www.frwr.com/about_wr.asp, accessed 5/23/06. Christmas Point Wild Rice Company. 2000-2005. About Wild Rice. http://www.christmaspoint.com/, accessed 5/23/06. Clayton, W.D., Harman, K.T. and Williamson, H. (2002 onwards). World Grass Species: Descriptions, Identification, and Information Retrieval. http://www.kew.org/data/grasses-db.html. [accessed 28 March 2006]. Erickson, S. 7/16/96. Wild Rice Production Process http://www.mnwildrice.com/riceinfo.htm, accessed 5/23/06. Nelson, J. 2000. Crop Profile for Wild Rice in Minnesota. Minnesota Pesticide Impact Assessment Program (PIAP). From USDA - NSF Center for Integrated Pest Management. North Carolina State University. Oelke, E.A. 1993. Wild rice: Domestication of a native North American genus. p. 235-243. In: J. Janick and J.E. Simon (eds. ), New crops. Wiley, New York. http://www.hort.purdue.edu/newcrop/proceedings1993/V2-235.html. Oelke, E.; Teynor,T. ; Carter, P.; Percich, J.; Noetzel,D. ; Bloom,P. ; Porter,R. ; Schertz, C.; Boedicker,J. ; and Fuller, E. Zizania aquatica L. January 9, 1998. http://www.hort.purdue.edu/newcrop/duke_energy/Zizania_aquatica.html. E.A. Oelke, T.M. Teynor, P.R. Carter, J.A. Percich, D.M. Noetzel, P.R. Bloom, R.A. Porter, C.E. Schertz, J.J. Boedicker, and E.I. Fuller. Wild Rice. Wisconsin Corn Agronomy. http://corn.agronomy.wisc.edu/AlternativeCrops/WildRice.htm, accessed 5/23/06. Texas Parks and Wildlife Department. 2006. Texas Wild-rice (Zizania texana).http://www.tpwd.state.tx.us/huntwild/wild/species/twildric/, accessed 5.23.06. 1854 Tribal Treaty Authority (2006). "Biology of Wild Rice." http://www.1854authority.org/page17.html, accessed 5/23/06. US Fish and Wildlife Service. 2006. Wild-rice, Texas. http://ecos.fws.gov/species_profile/SpeciesProfile?spcode=Q24A, accessed 5/23/06. Waikato Regional Council. 1999-2006. Regional Pest Management Strategy 2002-2007, Section 5 - Plant Pests. Environment Waikato. http://www.ew.govt.nz/policyandplans/rpmsintro/rpms2002/operative5.2.7.htm. Watson, L., and Dallwitz, M.J. 1992 onward. The grass genera of the world: descriptions, illustrations, identification, and information retrieval; including synonyms, morphology, anatomy, physiology, phytochemistry, cytology, classification, pathogens, world and local distribution, and references. Version: 28th November 2005. http://delta-intkey.com/grass/www/zizania.htm. Wild Rice Nation. 2006. Wild Rice Farming. http://www.wildricenation.com/pages/about-wild-rice/wild-rice-farming. Yamaguchi, M. 1990. Asian vegetables. p. 387-390. In: J. Janick and J.E. Simon (eds. ), Advances in new crops. Timber Press, Portland, OR. found at http://www.hort.purdue.edu/newcrop/proceedings1990/V1-387.html.